When you have diabetes, the biggest focus of your eating becomes managing your blood sugar levels. Which makes incorporating fruits into your diet a rather daunting task since fruits are known to raise blood sugar. However, you can eat fruits with diabetes and still achieve good blood sugar control as well as enjoy benefits directed specifically at your condition. For this, you have to choose low glycemic fruits. Low-glycemic fruits are essentially fruits that raise blood sugar gradually and steadily, contributing towards blood sugar control in both diabetics and non-diabetics. When eaten in moderation, of course. A fruit is low-glycemic if it has a low glycemic index and load. The glycemic index (GI) estimates how fast the carbohydrates in a food raise blood sugar. Below 55 is a low GI. Between 56-69 is a moderate GI. Between 70-100 is a high GI. The glycemic load (GL) estimates how fast the carbohydrates in a serving of a food raise blood sugar. Below 10 is a low GL. Between 11-19 is a moderate GL. Over 20 is a high GL. Diabetics and anyone needing to manage their blood sugar benefit most from choosing low-glycemic foods, whether it’s fruits or other types of foods. Fortunately, some of the most common and readily available fruits are also low-glycemic, including apples, strawberries, grapes and blueberries. 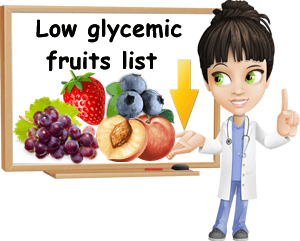 Whilst not the lowest GI and GL options (see 10 Lowest Glycemic Fruits), the following are 10 of the most commonly available low-glycemic fruits for diabetics. You can find apples anywhere year round. And while there are some minor nutritional differences between the different varieties of the fruit, notably in carbohydrate, sugar and fiber content, apples remain a low-glycemic option. The glycemic index for apples is 39, whilst the glycemic load is about 5-6 (for a serving of 100 g, all varieties included), both low scores. One large apple weighing an estimated of 223 g has an average GL of 12, moderate score. Tip: for lower effects on blood sugar, always eat your apples with skin. Whilst their season is rather short, fresh figs are a good low-glycemic fruit for diabetics and non-diabetics alike. 100 g of the fresh fruit provides 19.18 g of carbohydrates, of which 16.26 g are sugars and 2.9 g dietary fiber. While it may seem like a lot, the glycemic index for fresh figs ranges between 35 and 40, an overall low score. This makes the glycemic load 7-8 for a serving of 100 g, determined for both the lower and higher GI values. One large fig at 64 g has a GL of only 4-5, while one small fig at only 40 g has a GL of only 3. Overall, small servings of the fruit are unlikely to affect blood sugar levels extensively. Basically a smooth peach, nectarines are quite popular because of their lack of fuzz. But they also have a low glycemic index score (40) and only 10.55 g of carbohydrates per 100 g, of which 7.89 g are sugars and 1.7 g dietary fiber. The glycemic load for 100 g of the fresh fruit is only 4, a very low score. The GL for one large nectarine with an estimated weight of 156 g is 6, 6.5, also a low score. Whereas a medium fruit at 142 g has a GL of only 6, also a low score. Just remember to eat the fruit with skin to get most of the blood sugar-lowering fiber. Everybody loves strawberries and they are becoming increasingly available, even if just for limited periods of time. The good thing about strawberries is they are a low-glycemic fruit with a glycemic index score of only 40 and a glycemic load score of only 3 (GL determined for a serving of 100 g). One cup of strawberry halves (estimated weight of cup: 152 g) has a GL score of only 5. One cup of whole strawberries (estimated weight of cup: 144 g) has a GL score of only 4. One cup of pureed strawberries (estimated weight of cup: 232 g) has a GL score of around 7, also low. While a seasonal fruit, oranges are readily available several months a year. Their biggest benefit for diabetes is their low glycemic index: 40. An estimate of all commercial varieties of orange sets their carbohydrate content at only 11.75 g of carbs per 100 g of fruit, 9.35 g of which are sugars and 2.4 g dietary fiber. This means that the glycemic load for 100 g of orange is 4.7, estimated at 5. One cup of orange sections (estimated weight of cup: 180 g) has a GL value of 8.46, estimated at 8, a low score. One large orange weighing an estimated 184 g has a GL value of 8.6, estimated at 9, also a low score. There are those that say the GI of oranges is 45. Sometimes there are quite significant differences in the nutritional makeup of different varieties of the same fruit which can produce a more significant impact of its glycemic values. Assuming the GI score is 45, that would mean the GL of 100 g of the fruit would be 5.2, estimated at 5. The GL of a cup of fruit sections would then be 9.5. Plums are one of the most common fruits available worldwide and a trusty source of good nutrition, even for diabetics. The glycemic index for plums is 40, a low score. 100 g of the fresh fruit provides about 11.42 g of carbohydrates of which 9.92 g are sugars and 1.4 g dietary fiber. This would make the glycemic load for 100 g of plums 4.56, estimated at 5, a low score, good for blood sugar control. Whatever your choice of plum, remember to keep intake moderate and have the fruit with skin. Essentially a fuzzy nectarine, the peach is sweet, juicy and savory which explains its popularity. For a diabetic, the fruit is an acceptable option because it has a low glycemic index score of only 42 and reduced effects on blood sugar. There are only 9.54 g of carbohydrates in 100 g of peach, 8.39 g of which are sugars and 1.5 g dietary fiber. However, it’s best to keep intake moderate and have your peaches with skin to make sure you get the most of its blood sugar-lowering fiber. The glycemic load for peaches (determined for a serving of 100 g) is only 4, a fairly low score. One extra large peach weighing 224 g has a GL value of 9, also low. One large peach weighing 175 g has a GL value of 7 (low). One medium peach weighing 150 g has a GL value of 6 (low). You can easily find grapes from August till October, but they’re available throughout winter in many countries too. Their wide availability makes them a staple fruit. Depending on the variety and its carbohydrate content, grapes glycemic index ranges from 45 to 53, which is still a low score. Assuming the fruit is consumed in moderation, it’s safe to eat even with diabetes. Ideally, grapes should be consumed with skin so that you get most of the blood sugar-lowering benefits of the fiber. 100 g of European grapes has a glycemic load of 8-9.59 (low). One cup of European grapes (estimated weight: 151 g) has a GL of 12-14 (moderate). 100 g of American type, slip skin grape varieties has a GL of 8-9 (low). One cup of American type, slip skin grape varieties (estimated weight: 92 g) has a GL of 7-8 (low). The glycemic index of blueberries is between 40-53, fairly similar to that of grapes. There are two different types of the fruit: cultivated and wild blueberries (or Alaskan blueberries). However, there are overall little nutritional differences between the two varieties. Assuming a GI of only 40, blueberries GL is 6 (for 100 g of the cultivated variety) and 5 (for 100 g of the wild variety). Assuming a GI of 53, the GL is 8 (for 100 g of the cultivated variety) and 6.5 (for 100 g of the wild variety). Pomegranate seeds are not the actual seeds of the pomegranate fruit, but rather the seed coats or arils. Basically bright red, pink, yellow or colorless juicy sacs of pulp. Given their high carb content (18.7 g of carbs per 100 g), the glycemic index of pomegranates is 53, still low but bordering on moderate. This makes the glycemic load of a serving of 100 g of the seeds 9.9, low, but bordering on moderate. The GL of a cup of pomegranate seeds (estimated weight: 87 g) is 8.6, low score. Whilst you can definitely eat pomegranate seeds with diabetes, it’s good to keep your intake low and infrequent (preferably not have the fruit every single day), to avoid it raising your blood sugar levels. Note: When it comes to eating fruits with diabetes, whether they’re apples or plums or grapes or blueberries or any other fruit really, remember that you benefit more from eating smaller servings. A small serving ensures you get a limited amount of carbohydrates at once which helps you achieve better blood sugar control. Ideally, fruits should be eaten with skin (if possible) because fruit skins are an important source of dietary fiber, indigestible plant material that holds benefits for blood sugar control and for blood cholesterol. Most important, consider how foods affect you individually and adjust your intake according to your own reactions to different foods and different intakes of said foods.